We provide superior quality of automotive solutions that are well designed and developed and technically tested to be best used for various industrial purposes. We provide the wide range of Proximity Switches, Encoders, VFD & PLC with differential sizes and shapes used for various industrial applications. Our products are market No 1 automotive solutions that are reliable, durable and safe to use. We are also acclaimed for our high-class products for features like accurate dimension, high performance & strength and corrosion resistance. Our company aims at achieving complete client satisfaction and in meeting their requirements with quality end products. Our expert team holds specialization in providing world-class Automation Solutions in terms of planning, designing and installation. In addition to this, our organization is engaged in Integration Projects for various industries or sectors with PLC, HMI, SCADA, VFD, and Servo Motors & Drives. Some of our eminent client partners include BARC, L&T Ltd, United Beverage, Bhushan Steel & Strips Ltd, Uttam Galva Steels Ltd, Bharat Gear Ltd and Hindustan Coco cola BEV. Pvt Ltd. With the support and assistance of our mentor, Mr. Prashant Sadavarte, we have gained immense popularity in the highly competitive market. His ethical business policies and visionary approach have helped us to reach the pinnacle of success. Trading, Importer and Exporter of Electronic Components. Quality being our forte, we strive hard to offer a sophisticated range of Proximity Switches Encoders, VFD & PLC. The entire product range is manufactured using the high-grade raw material. While developing the products, our technical professionals ensure to follow the current quality standards and use high-grade quality raw material and advanced design tools and machines. Besides, at the associate's premises, the products are technically tested and approved for various parameters. Moreover, our in-house quality controllers also test the range to make sure that only impeccable products reach the client's destination. Our products are technically sound and tested for various parameters such as Durability, Dimensional Accuracy, Performance and Corrosion Resistance. 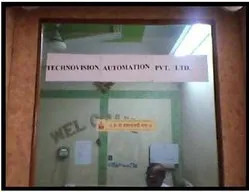 We at Technovision Automation have always built a strong foundation right from the beginning with our deep insights and focus on infrastructure development. Quality Enterprise solutions have been provided due to the right blend of talent and skills with the required ground of group work. With a very versatile and challenging environment, you can have a glimpse of the advanced hardware and software solutions that we have enriched and taken quality measures to improve the same. Our constant improvisation has played a vital role in quantizing the efforts of various industrial and control systems. Our quality proven range of Proximity Switches, Encoders, PLC & VFD has gained immense popularity amongst our clients. 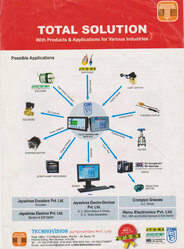 With their immense performance, accuracy and advance feature being most in demand, these are used in various applications in numerous industrial sectors such as Automobile, Breweries, Capital, Goods, Cement, Ceramics, Chemical, Construction, Consultant & Engineers, Elevators & Escalators, Sugar, Textile and much more. Being a global engineering company with leadership in industrial automation field in niche markets, our commitment to deliver quality products and services to our customers has also helped us to achieve optimum client satisfaction. Over the years, We have gained expertise in providing efficient Automation Solutions to our clients. We provide these services in terms of planning, designing and installation. We have been catering to the needs of various industries across the country. With the help of our professionals, we provide these engineering and consultancy services as per the specific project requirements. Valuing our client requirements and satisfaction, we believe in quality and provide our clients with a wide range of superior quality automotive solutions. 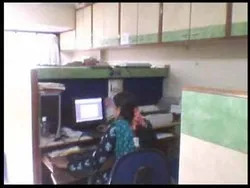 Owing to our engineering solutions, we have successfully completed various major industrial projects with remarkable performance and output like Plasma printing machine control, Filling and packaging machine system, Speed monitoring system of the conveyor, Carton filling machine control, Welding machine control and much more. Being a client centric organization, we ensure to offer superior quality range of Proximity Switches Encoders, VFD & PLC to our clients. We are totally committed to dispatching high-quality products as per their specific requirements. Owing to our ethical organizational policies and transparency in business dealings, we have gained incredible success and become one of the preferred choices amongst our clients. Continuous introduction of modern and appropriate products of good quality backed by efficient after-sales services has also helped us to emerge as leaders in the field of industrial Automotive solutions. We encourage & appreciate resourceful employees and provide the environment to foster creativity & innovation. We value individual involvement & contribution but believe in team spirit with the company's interest above all integrity. Some of our reputed clients are L&;T Ltd, BARC, United Beverage, Bhushan Steel & Strips Ltd, Uttam Galva Steels Ltd, Runwal Group, Balmer Lawrie-Van Leer Ltd, Hindustan Coco cola BEV. Pvt. Ltd, Bharat Gas and Bharat Gears Ltd.
We are empowered by a diligent team of professionals, which is the backbone of our company. Our professional experts hold rich industry experience and can easily handle technical design and development of quality industrial automotive products. Our professional team includes Technicians, Engineers, Sales & marketing experts and Office Coordinators. Hence, we ensure to provide utmost solutions according to customer's requirements. Our expert's team have maintained great harmony with Jayashree Electron Pvt. Ltd. (Pune) who offer us an outstanding range. All the experts work in close coordination with each other towards attaining the set organizational goals. Our skilled technicians and engineers are further dedicated to providing reliable Automation Solutions. Moreover, these engineers also endeavour to reduce the time cycle for both erection and maintenance.